We all want better food for our kids. And, short of producing it in our own backyards and kitchens, we want our food brands to be better too. So what does it take to build – and grow – a responsible food brand? We recently had a fascinating opportunity to join in a freewheeling conversation with top leaders from Annie’s Homegrown and its parent company, General Mills about the general direction of their food products and the future of organics. And what we learned was that it’s hard to make changes overnight, but the consumers of today are slowly helping to steer major brands toward the better, more wholesome foods that we all want to see. First things first – The elephant in the room: Annie’s Homegrown has, for 25 years, been an independent company producing wholesome, ingredient-driven food with a social conscience. Then last year, food giant General Mills bought Annie’s…infuriating many Annie’s loyalists who feared the company had sold out. But Annie’s CEO John Foraker said that Annie’s wouldn’t stop doing things the way it had always done them…and it could possibly lead the way for other “little” companies to grow bigger.”I said, Ken (Powell, General Mills’ CEO), if we join, we aren’t changing,” said Foraker of the move to General Mills. 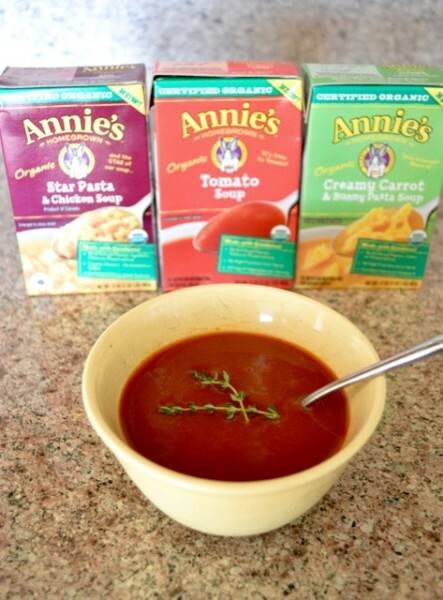 A selection of Annie’s organic soups..
One factor hampering large-scale expansion of organic foods: the lack of organic farms. Fewer than 1 percent of America’s farmlands are dedicated to organic farming, according to O’Brien. Another challenge is the price premium currently commanded by organic foods – possibly a cost that would come down if the supply of organic foods could be ramped up. Consumer Reports recently found that organic foods cost, on average, 47 percent more than conventional food (although there was a great deal of variation depending on the product). Foraker says he envisions a future where 15 to 20 percent of our food supply would be organic – and it would be available to more consumers, at a more accessible price point. Would this represent a massive change in the direction of our system? Perhaps, but that’s what an increasing number of consumers are asking for. Consider this: Most of the changes in foods in the last decade or so have come from consumer demand – and in some cases even from employees within the company. For example, General Mills originally started developing gluten-free Chex at the request of an employee whose family member had celiac disease. Another General Mills brand, Yoplait, removed high-fructose corn syrup from its yogurt in 2013 due to overwhelming consumer feedback. Earlier this year, the company took the move a step further by reducing the sugar content of its yogurt by 25 percent. Recognizing the ongoing demand from parents and families for healthier prepared and packaged foods, executives at both Annie’s and General Mills seem determined to produce more of those foods with high-quality ingredients and get them in front of more people. 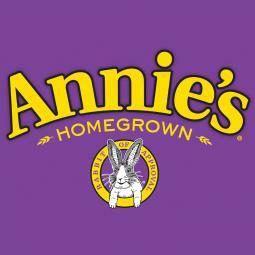 Annie’s recently took a step ahead on this front when it announced that two varieties of its Organic Bunny Grahams, including Honey Bunny Grahams and Friends Bunny Grahams, will be available in K-12 schools nationwide beginning January 2016. Annie’s is one of the first leading natural and organic brands to make its way into cafeterias under the USDA’s new standards to improve the quality of school nutrition. “Ultimately, the consumer is going to win here,” said Foraker. We’re looking forward to see more changes for the good. Blogger disclosure: We were invited to dinner by members of the Annie’s team. We did not receive compensation for this post. All opinions expressed are our own.